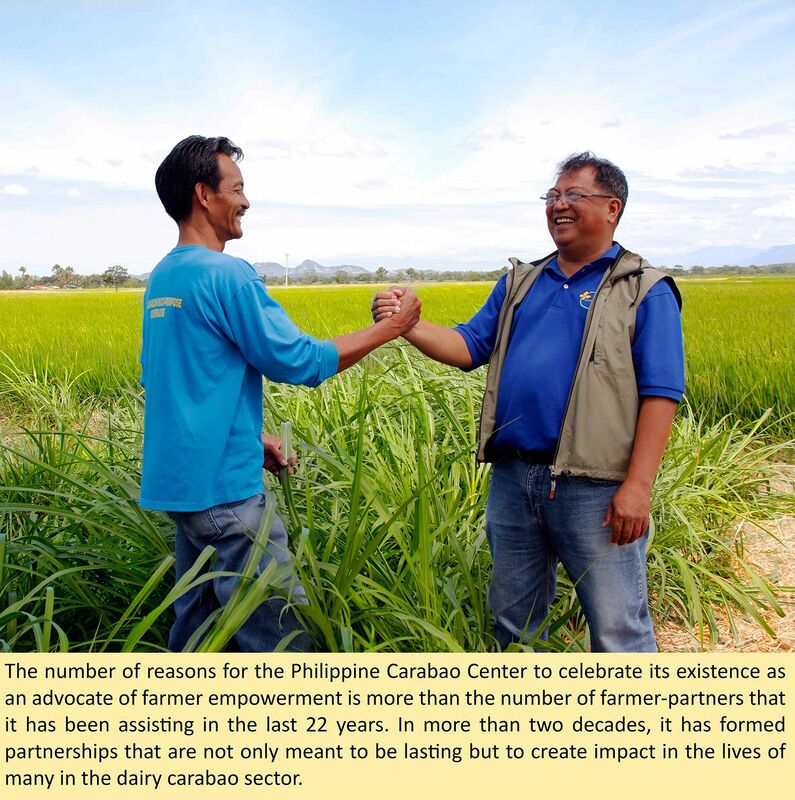 Over the years, the Carabao Development Program (CDP) of the Philippine Carabao Center (PCC) has demonstrated that buffalo-based dairy enterprises can indeed lead to substantial economic and social gains for farmers and their families. These developments include strides in dairy animal herd build-up, increased incomes and job opportunities, and expanded tie-ups among key industry players. The PCC’s linkage with concerned stakeholders in the buffalo-based dairy industry continues to be highly productive and beneficial. Linkaging and partnership proved to be an effective strategy in pursuing PCC’s development goals for the dairy industry, particularly in implementing its widescale carabao upgrading program (CUP) through artificial insemination (AI), bull loan (BL) along with enterprise development initiatives. This strategy, is being sustained with partner agencies and local government units (LGUs) at the provincial and municipal levels. The PCC’s partnerships find significance in the context of its mandate as a research for development entity focusing on the improvement of the genetic potentials of the Philippine Carabao for milk and meat as a means toward uplifting the economic and social well-being of smallholder farm families, and as the lead agency in livestock biotechnology R&D in the Department of Agriculture network. Exemplary partners emerged from these partnerships who have already successfully implemented village-level dairy buffalo projects which can be found in the provinces of Nueva Ecija and Bohol and in Region 2. Dairy farming in Nueva Ecija is now considered a progressive sector thru the collaborative efforts of PCC and its partner local government units. Nineteen municipalities and cities in Nueva Ecija are consistently benefiting from the widescale CUP since the declaration of the province as the National Impact Zone (NIZ) of PCC for dairy buffalo enterprise development in 1998. Through the NIZ template, the province became the country’s major buffalo’s milk producer. The NIZ promotes an integrative agribusiness system through the 25-dairy buffalo module. It served as the gear for speeding up the development of a viable carabao-based enterprise in Nueva Ecija. Also, the genetic improvement of the native carabaos through crossbreeding with the dairy breed was included in its goal. As of December 2015, the total animal inventory in the NIZ is 3, 505 head of purebred buffaloes. Of this number, 2, 579 are female and 926 are male buffaloes. Currently it has 51 dairy cooperatives with 1,051 farmer-trustees which constitute the Nueva Ecija Federation of Dairy Carabao Cooperatives (NEFEDCCO). The federation was established as a marketing arm of the member-cooperatives. It facilitates all processes within the value chain from milk collection to marketing of raw and processed milk products in local and mainstream processors and consumers. In 2015 alone, a total traded volume of 833,216.35 kilograms of milk is produced by the dairy cooperatives,which is translated to Php42, 177,041.66 amount of sales. The average income of a dairy farmer per lactating animal ranges from Php48,000 to Php62, 000 for a 10-month period. Out of this daily cash flow, farmers were able to send their children to school, get better health care for their families, purchase new household appliances and vehicle, save additional fund for house improvement, expand animal pen and forage areas, and purchase new farm implements. Aside from the tangible benefits of daily income, access to everyday supply of fresh buffalo’s milk has helped reduce malnutrition incidence in the province and some localities. A total of 18,741 malnourished children were assisted from 2002 to 2007. The dairy impact zone development framework has also generated additional jobs for farm families as well as the cooperatives, artificial insemination technicians, bull caretakers, milk collectors and delivery men, milk processors and many others involved in the dairy enterprise. These include ancillary businesses in the form of vermicomposting, effective microorganism (EM) organic fertilizer production, milk processing and private milk distribution. Along these developments, synergy and critical support between and among dairy secondary stakeholders are maintained to ensure the sustainability of the success of the dairy sub-sector within respective municipalities. These stakeholders are composed of the Nueva Ecija Provincial Government (NEPG), Department of Trade and Industry (DTI), Department of Agrarian Reform (DAR), Small and Medium Enterprise Development Council (SMEDC), Department of Science and Technology and the local government units of Llanera, Talavera, General Natividad, San Jose City, Science City of Munoz, Guimba, and Sto. Domingo in Nueva Ecija. For example, with the help of DTI, the institutionalization of Gatas ng Kalabaw Festival in Nueva Ecija’s became possible starting 2007. The localization of the event aimed to promote carabao’s milk as the One Town One Product (OTOP) of Llanera, San Jose City, Science City of Munoz, Talavera, General Natividad, Guimba, and Sto. Domingo. In its pursuit to create more avenues for opportunities and marketing support to dairy farmers in the province, PCC, with support from DTI and DAR, launched in 2015 a market venue called “Dairy Box Dairy Delicatessen” that showcases buffalo-derived products. The one-stop-shop offers “pasalubong” treats and pastries made by Catalanacan Multi-Purpose Cooperative (CAMPC) and other local dairy buffalo farmers’ cooperatives. This direction of partnership between PCC and its partner-agencies will continue to prosper toward empowering farmers as support is promised to continuously flow even with the change of leadership in their respective municipalities. Partnerships also continue to stimulate regional development in Region 2 and parts of the Cordillera Administrative Region along the areas of CDP promotion and advocacy. Leading this mandate in the Northern Luzon development is PCC at Cagayan State University (CSU) covering the provinces of Cagayan, Isabela, Nueva Viscaya, Quirino, Batanes, Apayao, Kalinga and Ifugao. Through the program “Strengthening the Philippine Carabao Research and Development” in 1981, PCC at CSU started the development of the carabao for milk, meat and draft purposes through crossbreeding with native carabaos. Program implementation was ensured to smoothly progress thru close partnership with various government and non-government agencies and organizations. As partnerships are continuously established, the protocol for CUP was steadily refined thru the help of reproductive technologies such as AI complemented with bull loan program (BLP). The organized efforts of PCC at CSU in the north began to pay off as tangible outputs became more visible on the ground. From 1981 to 2014, the AI output totaled to 79, 313 animals or equivalent to 20.6% calf production rate. Through the launching of the Unified Artificial National Insemination Program in 2000, the service rate for the carabao population was increased while more AI technicians in the region were trained. To fast-track the crossbreeding of native carabaos, purebred bulls were provided where AI service is not available. It was in 1994 when the BLP was implemented in various municipalities in Cagayan and Isabela and later on carried out to the provinces of Quirino, Nueva Viscaya and Batanes. As of 2014, a total of 411 bulls were loaned out to these provinces with 4,309 crossbred calves produced. With the right combination of AI and bull loan, production of crossbreds increased in the municipalities of San Agustin, Isabela, (1,794 crossbreds in 13 barangays), Solana, Cagayan (459 crossbreds), Amolong, Cagayan (375 crossbreds), Naguilian, Isabela (314 crossbreds), and Bagabag, Nueva Viscaya (127 crossbreds). As more crossbreds are seen on the ground, the CUP partners saw the need for developing carabao-based enterprises. The carabao-based enterprise development (CBED) started in 1997 with the Dairy Multi Purpose Cooperative (DMPC). Tuguegarao City as the pioneering program recipient of 300 head of imported Bulgarian buffalos that arrived in Region 2 from 1999 to 2000. The animals were later awarded to eight dairy cooperatives and four government institutions in the region. In 2000, the Carabao Strategic Development Zone was launched in partnership with DAR-02, Cagayan, DTI-02, Department of Science and Technology Region 2 (DOST-02), Tuguegarao, and National Economic Development Authority Region 2 (NEDA-02). This initiated the development of the impact zone concept. To further guide the investment and development of the dairy industry in the region, the Integrated Regional Dairy Development Plan for the period 2006 to 2015 was approved in September 2007. Members include NEDA, PCC, DAR, DOST, LGU, National Dairy Authority (NDA), Department of Labor and Employment (DOLE), Department of Interior and Local Government (DILG), Philippine Exporters Confederation, Inc. (PhilExport), Cagayan Economic Zone Authority (CEZA), State College and Universities, Cooperative Development Authority (CDA), and Landbank of the Philippines (LBP). The number of established dairy associations increased as an additional 28 dairy associations of crossbred owners were established from 2008 to 2014. To enhance the capabilities of dairy farmers and others involved in the dairy enterprise, five Canadian expert volunteer advisers provided assistance through the support of DTI in the areas of dairy management, AI reproduction and health, milk processing, training and extension, packaging proposal for international funding assistance and study mission to Canada. In order to achieve 25% growth rate of milk from 2010 to 2025, the DTI and Japan International Cooperation Agency (JICA) through the National Industry Cluster Capacity Enhancement Project (NICCEP) granted Php1 million fund assistance as its support to the industry dairy cluster capacity enhancement program that includes a study mission in Thailand and attendance to dairy business conference and trade fairs. NICCEP is a three-year project that aims to enhance the capacity of selected industry clusters to plan, implement, facilitate service delivery, evaluate projects and improve industry competitiveness and business environment. Another Php1.5 million was granted to PCC at CSU by the DTI Shared Service Facilities (SSF) program in 2013 to 2015 to provide equipment to the dairy cooperatives and associations that will help improve production and processing of milk to achieve better quality and increased shelf life. The SSF beneficiaries include Integrated Farmers Cooperative (IFC), Dairy Multi Purpose Cooperative (DMPC), San Antonio Dairy Carabao Raisers Association (SADCRA), San Agustin Dairy Cooperative (SADACO), Bangag Carabao Owners Dairy Association (BCODA) and Sampaguita Livestock Producers Dairy Association (SLDPA). The PCC-Korea International Cooperation Agency (KOICA) and PLGU also provided Php10 million fund assistance to SADACO in 2010 to 2013 to support the implementation of the CUP through the organization of dairy associations and cooperatives, establishment of milk processing plant, AI, BL and CBED, deployment of Korean Overseas Volunteers, provision of processing equipment and mobility and construction of five milk barns. All of these efforts resulted to the total milk production of 1,110,297 liters valued at Php49.9 million from 1999 to 2014. In 2015, financial support amounting to Php505 million was also given by the World Bank through DARFU-O2 and the Philippine Rural Development Program (PRDP) to support the dairy industry in the region. Beneficiaries of PRDP include Integrated Farmers Cooperative (Dairy Buffalo), Malaya Development Cooperative (Dairy Cattle) and Rang-Ay Ti Pussian Multi Purpose Cooperative (Dairy Buffalo). Part of this fund will be used for the entrustment of 150 head of Italian buffaloes and 45 Bulgarian buffaloes to multiplier farms and select dairy farmer cooperatives. That same year, dairy cooperatives in the region registered their umbrella organization Cagayan Valley Federation of Dairy Cooperatives consisting of 11 member-cooperatives. “PCC is just one of the drivers of development and our partnership with various government agencies like DTI, DARFU, DAR, DOLE, DOST, DILG, PLGUs, MLGUs, SCUs, CDA, DENR, PCIC, PSA-BAS and foreign government agencies like JICA, KOICA, CESO and World Bank, including non-government organizations and local financing institutions were instrumental in the development of the carabao industry in region 2,” PCC at CSU Center Director Franklin T. Rellin, said. Dairy farmers in Bohol now produce more than 50,000 liters of buffalo’s milk in a year compared to its milk production of less than 11,000 liters of milk in 2010. The number of farmers actively involved in dairying increased from 18 in 2010 to 512 in 2015. So far, the biggest achievement in Bohol dairy industry was the institutionalization of carabao improvement and development in the province. The PCC at Ubay Stock Farm (PCC at USF) spearheaded the implementation of CDP in the Bohol province. Determined efforts to develop the local dairy industry had its beginning in 2009 where the Comprehensive Health Agricultural Technologies and Tourism Opportunities Development Program (CHATTO) for the towns of Ubay and Mabini was conceptualized. This was approved for implementation in 2010 and has been replicated by interested municipalities in partnership with the local government units since then. The program paved the way for the establishment of school-based dairy enterprise as well as milk feeding program in the six town-beneficiaries. In 2014, the Department of Social Welfare and Development (DSWD) signed a partnership agreement in the development of sustainable livelihood through Dairy Enterprise Development in Bohol under the DSWD’s Sustainable Livelihood Program (SLP). To boost the dairy enterprise in Bohol, the DSWD downloaded Php10 million worth of starter kit training fund to PCC at USF recently. Six hundred Pantawid Pamilya beneficiaries from the towns of Ubay, Mabini, Alicia, San Miguel, Dagohoy, and Trinidad will be supported in the project. Under the partnership between DSWD and PCC, families will each receive a native carabao for milk production and a provincial government support for insurance. Aside from the DSWD fund, the Bohol provincial government, through Gov. Edgar M. Chatto, provided a counterpart fund of P916,500 for the one-year insurance of the animals. “Under our Dairy Development Program, we have seen an impressive 15% increase in the production of raw milk, amounting to P11.575 million. This has also led to an 81% increase in the sales of dairy products, amounting to P9.425 million in 2014. And the future looks even brighter for the dairy industry, with our forthcoming Bohol Carabao Dairy Processing Marketing Enterprise, a P13-million project to be implemented under the Philippine Rural Development Program (PRDP),” declared Gov. Edgar M. Chatto during his State of the Province Address in 2015. Dr. Arnel N. del Barrio, PCC acting executive director, said the convergence initiative is significant because it means income generation not just for the farmers but also for the Bohol province as a whole. He hopes to replicate the partnership program in other parts of the country.